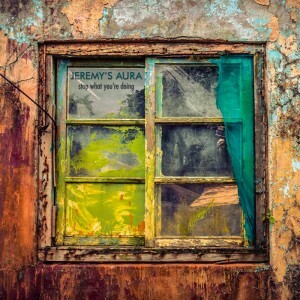 Jeremy’s Aura returns to Maia Brasil Records and Omnitropic with his second full-length album, Stop What You’re Doing. For Jeremy, this album came about as a direct response to some very unpleasant circumstances in his life. We are ultimately not the ones in control of what happens and sometimes we are left with no choice but to stop what we’re doing. In these troubled times music was a guiding light and savior for Jeremy. Cooped up for several months, physically frail and mentally weak, Jeremy set about filling his time by composing and producing music. This album is the culmination of that healing experience. Though there may be moments where the trials of the hermit are audible, the overall result is a solid, balanced, and refined musical and emotional experience. Jeremy lets experimentalism take the foreground without much consideration of genre-based aesthetics or audience expectations. He even lets his sound art roots shine through the use of field recordings. The approach was not solely experimental though; on this album we can hear an evolution of the artist’s sound, still recognizing the quirky dub and progressive rock influences without falling into any established patterns. Each song is a unique experience, linked together by the mindset behind them but also standing alone. This album lets all the emotions come together and overlap: happy, quirky, and energetic; moody, emotional, and serious; sensitive, sensual, and delicate; comedic, light of heart, and playful; and right back around the loop. As intense as this story is, Jeremy has always maintained a strong belief in humor and playfulness as a true force of nature and in the case of this album, laughter really is the best medicine. All music composed, performed, produced, and mixed by Jeremy Costa. Vocals on track 5 by Bridget Debernardi; vocals on track 7 by Karina Ultra K. Analogue summing and mastering by Sammy Wags. Original photography and design by A. Synaptic. MP3 Download | FLAC Download | WAV Download · Download count: 10,451.
some great songs in here… very emotional and introspective, I’m enjoying exploring this deep release a lot… thank you!!! Jeremy – thanks for sharing a piece of your soul, I was moved and I wish you the best of luck in the future with your health and happiness! Very deep music, this is the first time within the week i had some time to myself… the memories kept on flowing as the songs passed and the feeling that i didn’t want this album to end grew as the songs played through.. Exquisite, beautiful and slightly deranged . . excellent!!! really amazing stuff. intelligent and arty psydub. I can only imagine he must know some music theory to write chord progressions like these. 5 star album, but there should be a million stars for you! thank you!